In the early stages of your career, you may have had the benefit of an employer-sponsored 401(k). If you were really lucky, you may have even had contributions matched by an employer or two. And while you were focused on climbing that ladder, your 401(k) sat idly in the background beginning the foundation of your future retirement accounts. Typically, rolling over your 401(k) means moving your retirement assets into a traditional individual retirement account, or IRA. You can also roll over into a Roth IRA, but doing so may result in a large tax bill due to the fact that your original contributions were likely made on a tax-deferred basis and are subject to tax upon withdrawal. Made up of a variety of known environmentally conscious companies, our environmental portfolio incorporates those willing to rethink the status quo, addressing their long-term environmental impacts, and choosing to operate on an eco-first and eco-friendly basis. Our human rights portfolio is comprised of those companies that have corporate policies and practices focusing on promoting a fair and equitable workplace. Many of these companies have won accolades and recognition for confronting issues with employee, customer, supplier, and community interaction. Our peace portfolio is the one that started it all for Invested Interests. The companies in our peace portfolio play a positive role in furthering peace on our place and limiting conflict. While the methods vary, we invest in companies that have taken positive steps to limit support of governments and regimes promoting violence. Our diversity and corporate governance portfolio is made up of companies working to create a culture of inclusion, new ideas, and foster strength in their team through inclusive policies. Whether by broadening their board of directors or establishing human resources policies of inclusion and support, these companies are taking the right steps to the fair and ethical treatment of employees. Many of the companies included in our portfolio are leaders in sexual harassment training and provide information, seminars, and resources to their employees. There are no fees to roll over a 401(k) into a traditional or Roth IRA. In fact, you’ll likely save money on management fees over the duration of your investments. Left unmanaged, many 401(k)s end up with high management and maintenance fees. Investment opportunities and understanding has changed dramatically since the rise of online trading and robo-advisers. While these two options still have their shortcomings, they did pave the way for more aggressive fee structuring. 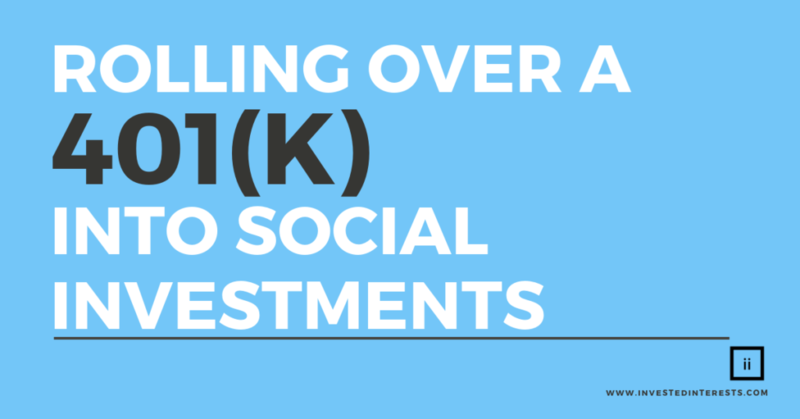 Most traditional 401(k)s do not support ESG (economic, social and governance) rated social investments. Rather, most focus on the very large-scale businesses that are generally focused on revenue-focused, not socially responsible business practices. When setting up your 401(k) you likely had a choice of a few mutual funds. However, with an IRA, you have a full-selection of funds to choose from and can create a better long-term strategy based on risk management, ESG ratings, and your retirement goals. Former employers go out of business. Their retirement options and advisors change. Whenever you change positions, you always have the option of moving your account into a new employer’s 401(k) or to an IRA. While you can sometimes leave it where it is, for most individuals, rolling over to an IRA is the best choice. If you are like most Americans and change positions every few years, it may be time to gain control and oversight over all of your retirement accounts. Diversification is powerful. So is knowledge. Especially when it comes to retirement planning. Considering a 401(k) rollover? Request a FREE impact investment consultation, and we’ll be in touch!